After months of waiting, Sony finally released a proper trailer for Venom that actually showed the symbiote for the very first time. Many fans were excited to see Tom Hardy's Eddie Brock transform into the iconic anti-hero, but it didn't take long for the detectives to come in and point out that there were some weird things going on in this latest sneak peek. For instance, a few internet sleuths got into a debate about the true way to pronounce the word "symbiote," figuring out that the trailer pronounces the name wrong more than once. Out of all of the takes on the new Venom trailer, none were as enlightening, or as hilarious, as actress Elizabeth Banks'. The latest Venom trailer features a lot more dialogue than the last one, which has also been picked apart by fans of Tom Hardy. But Elizabeth Banks noticed something much different while watching the trailer for the first time. Instead of focusing on the dialogue or noticing the mispronunciation of symbiote, she found something weird with the visual effects towards the end of the trailer. Banks explains. "Looks like he's eating a d*ck." Now that Elizabeth Banks has pointed out what she thinks is going on in the Venom trailer, it's pretty hard to un-see it. Seth Rogen was one of the first people to chime in on Banks' tweet, saying, "In my version of the movie, he would be." The post ended up with a lot more jokes from concerned Venom fans, but there were actually a few people that stood up for the upcoming movie and noted that they were really happy that Rogen wasn't involved with the project in any way, shape, or form. 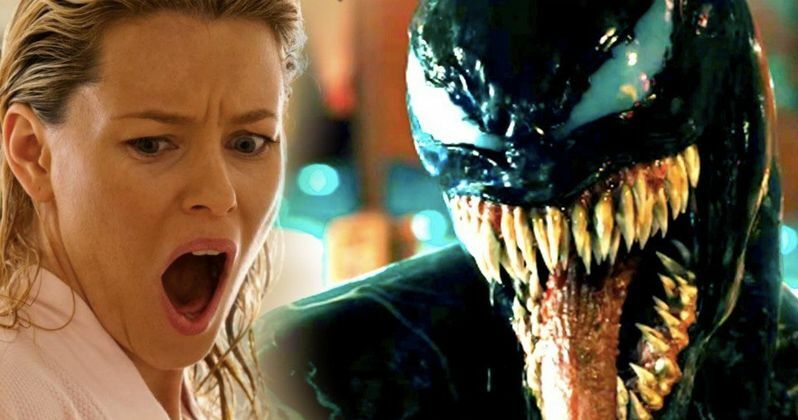 Seth Rogen wasn't the only celebrity to notice Elizabeth Banks' observation about the Venom trailer. Sophia Bush was happy that somebody else noticed the phallic nature of the symbiote's tongue, and thanked Banks for backing her up. Chris Mintz-Plasse simply said, "this is how Twitter should be used", while Ricky Gervais compared the social media exchange to a conversation between Clark Gable and Vivian Leigh. In the end, Elizabeth Banks said that she was kidding around and thought that the trailer looked "hot." For the majority of people following the Venom movie, it just can't seem to catch a break in the marketing department. The first trailer was released in February of this year, only a few weeks after the production had wrapped. The teaser was pretty vague, and it looked like a normal action movie, nothing like what long-time fans had been expecting. However, worst of all, there was no sign of the symbiote, which did not sit well with anybody. Now, we have the symbiote and it looks like he's doing weird things with his mouth along with the mispronunciation of the word "symbiote." Sony's Venom opens on October 5th, so there's still plenty of time for more promotional material to come out. Many Marvel fans are hoping that the future footage releases will at least tease Carnage, which has been yet another criticism of the newly released trailer. Hopefully everything works out for the Venom movie when all of the dust settles because it doesn't appear to be gaining any real type of positive hype at the moment. You can see some of the new criticisms of the new Venom trailer below, thanks to Elizabeth Banks' Twitter account. So apparently zero people making the Venom movie care enough about the character to know how to pronounce "symbiote"
For those wondering if Venom connects to MCU Spider-Man, it doesn't.